Cerama Bryte 20618 Ceramic Cooktop Cleaner will give that like-new shine to many of the areas and appliances inside your home. It removes tough stains and is recommended for use on all smooth-top cooking surfaces. 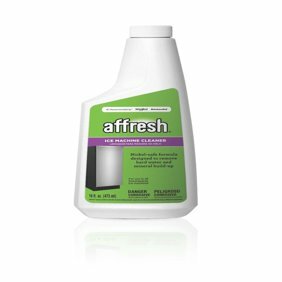 This cleaning equipment is formulated for heavy-duty cleaning without scratching. Regular use helps maintain shine and performance. It contains no silicone and phosphates. It's also safe to use on porcelain, cultured marble (bathrooms), glass shower doors, fiberglass bath units, pots and pans and stainless-steel sinks. I received a small bottle of this product when I purchased my new stove. I loved it and when it ran out wanted to find it. Wasn't in my local store and ordered online. I recommend this product to anyone with glass top stove. I got a new stainless steel stove with a stainless steel cook top. I could not get the brown heat marks off. THIS WORKS!!! Friend had told me I didn't have to use a specific cleaner for my ceramic cook top. I cleaned it with the usual product then used CeramaBryte it was unreal the amount of dirt that came off my cooktop. Cerama Bryte Cooktop Cleaner is excellent for my glass top stove. Cleans our new black GE stove top easily without leaving any noticeable streaking. Using the product reminded me of my younger days of polishing my first car, i.e. apply the cleaner with a dry paper towel or cloth and when the cleaner turns white which is almost immediately, wipe it off with a soft cloth using very little effort and "presto" grease and stains are gone. You won't get the same results using a common liquid glass cleaner because of the grease spatter from cooking.